Introducing the BRU (Basic Rifle Upgrade). Now the innovative ergonomics of the original Stark SE-1 Rifle Grip are available in a basic rifle upgrade kit. 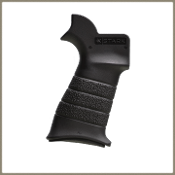 The grip geometry is identical to the Stark AR rifle grip without the integral trigger guard or storage plug, providing a lower cost rifle upgrade. The BRU AR Rifle grip has no integral trigger guard, which allows for installation on any AR rifle, including billet receivers. Shooters who prefer to retain the original trigger guard on their rifle will appreciate this easier to install, lower price grip. As with our standard AR grip the angle of the grip is more natural for your hands, closer to a 90-degree angle, allowing the shooter's arms to stay tighter to the body with the wrist straighter. The hand stop located at the upper back strap locks the hand in at the same position and the index finger at the same angle to the trigger every time for consistent shot placement.